In each Transitions section of Preservation magazine, we highlight places of local and national importance that have recently been restored, are currently threatened, have been saved from demolition or neglect, or have been lost. Here are are six from Spring 2018. 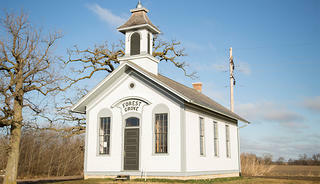 A one-room schoolhouse built in 1873, Forest Grove served children in the rural community of Bettendorf, Iowa, for nearly 85 years. 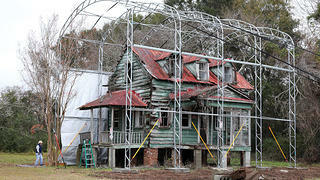 After closing in 1957, it sat empty on farmland near a main road. The school’s foundation crumbled, parts of the wooden floor and exterior weatherboarding rotted, and its window sashes and doors were lost to neglect and vandalism. Sharon Andreson, a Bettendorf resident, grew concerned that the building would collapse. She founded Forest Grove School Preservation (FGSP) in 2012 and began restoring the weatherboards soon after. With assistance from architect Doug Steinmetz, volunteers with the nonprofit worked from historic photos to reconstruct the structure’s bell tower, windows and doors, foundation, roof, and signage. The group raised funds for the project—which will total about $200,000 when completed—through community events like pie auctions and trivia nights. Locals provided labor and materials at a discount or no charge, including donations of floorboards and slate chalkboards from three nearby schools, two of which had been demolished. The exterior restoration was mostly finished in late 2017, and FGSP will restore the interior plasterwork and floors by late 2018. Andreson intends to open Forest Grove School as a museum that interprets Iowa’s early rural-education initiatives. 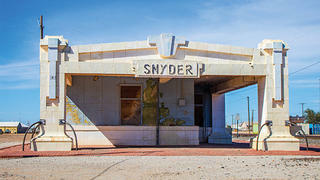 This circa-1911 train depot in Snyder, Texas, was one of only two surviving depots architect Louis S. Curtiss designed in the state. (Originally there were four.) Trains with the Santa Fe Railway carried passengers and freight to and from the depot for decades, but declining demand for rail travel prompted the company to close the depot to the public in 1968. It then served as an office for the local railway agent, and later as storage for signal and track workers. Because the railway (now the Burlington Northern Santa Fe Railway Company) wasn’t regularly using the depot, it decided in 2016 that maintaining the structure wasn’t practical. Paula Hatfield of the Scurry County Historical Commission searched for a way to preserve it, but the depot’s proximity to active train tracks presented safety concerns, and its heavily reinforced concrete construction made it too difficult to move. Ultimately, a new use for the defunct station couldn’t be found. Demolition crews took down the building in November of 2017. 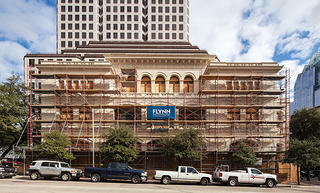 Before demolition, Hatfield worked with the railway and its demo crew to remove 17,000 brick pavers, one of the terra-cotta “Snyder” signs on the building’s exterior, and two 500-pound planters. She hopes to include them in a future exhibit at the Scurry County Museum, which currently has many of the artifacts in its archives. This 42,243-square-foot limestone building in Austin, Texas, opened in 1881 as the United States Post Office and Federal Building. University of Texas System (UTS) purchased it in 1968 to use for office space, and renamed it O. Henry Hall after the short-story author who was convicted of embezzlement at the courthouse in 1898. UTS sold it to Texas State University System (TSUS) in 2015. Before staff could move in, parts of the building needed to be repaired, restored, and updated. Construction work began in late 2017 and was funded partly by state historic tax credits, which only recently had become available to universities. The building’s interior wainscoting, trim, and ornamental plasterwork were mostly intact. The exterior, however, needed work. The project’s restoration architect, Tere O’Connell, and her team surveyed the building’s 160 windows and identified original pine sashes and frames that were damaged from mold, pests, and the Texas heat. They were able to preserve 95 percent of the wood. O’Connell also restored the former courthouse’s exterior wooden doors and conducted minor masonry repairs. TSUS moved into the building in January of 2018, and plans to carefully monitor exterior masonry conservation issues. 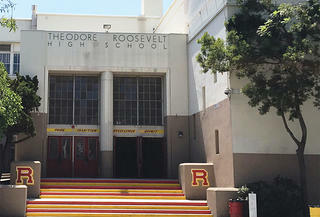 A group of buildings on the Roosevelt High School campus in Los Angeles are threatened with demolition as part of a push by the Los Angeles Unified School District (LAUSD) to modernize its public schools. The high school was one of several whose students participated in the Chicano Student Walkouts in 1968 that aimed to bring attention to discrimination against Mexican-Americans in the L.A. public school system. The protests helped bring the Chicano Civil Rights movement into the national spotlight. One of the threatened structures, R Building, dates to 1922 and was the central location for walkout-related events. A recent seismic analysis of the building commissioned by LAUSD concluded that it would be too challenging and intrusive to retrofit. A structural engineer for the Los Angeles Conservancy, a nonprofit advocating for R Building’s preservation, requested evidence to support the claim, and the Conservancy is reviewing alternatives with the school district. The Conservancy notes on its website that it “believes that LAUSD can provide safety, quality education, and historic preservation.” The district may not reach a decision until this summer. After an 11th-hour attempt to save the Lockridge Medical Clinic from demolition failed, crews tore down the structure the night of January 10, 2018. 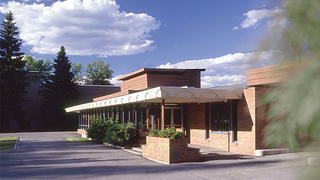 Frank Lloyd Wright designed the modest Usonian building in Whitefish, Montana, in 1958, near the end of his career. It last housed a law firm, which sold the building to a developer, Mick Ruis, in 2016. He intended to demolish the building and replace it, stating that he wasn’t aware of Wright’s significance to Whitefish and to the wider architectural community. Montana Preservation Alliance (MPA) and the Frank Lloyd Wright Building Conservancy (FLWBC) monitored the building closely. In November of 2017, MPA and FLWBC learned that if demolition were to occur, it wouldn’t be until the end of 2018. However, in the first week of January, Ruis announced that he would demolish it sooner, unless he received an offer for $1.7 million in cash. On January 8, 341 Central LLC, which was formed by the FLWBC specifically to purchase the building, made a full-price offer contingent on a refundable down payment and 60 days to secure the remainder. Ruis countered on January 9 with a demand for a nonrefundable deposit 50 percent higher than what 341 Central had initially offered, with a deadline of the end of that day. FLWBC and MPA were unable to raise the funds in time, and their request for a one-week extension was refused. Negotiations ended at 4 p.m. on January 10, and the building, one of a few remaining Wright-designed structures in Montana, was demolished less than six hours later. Having been evacuated during the Civil War, many formerly enslaved African Americans returned to Edisto Island, South Carolina, during and after Reconstruction. Among them was Henry Hutchinson, born into slavery on the island in 1860, who established a successful planting operation and built a house there for himself and his wife, Rosa, in 1885. The house remained in the family until 2016. Its view of a wildlife management area makes it a desirable spot for development, so to protect it a family member sold the house and the surrounding 10 acres to the Edisto Island Open Land Trust (EIOLT), a land conservation nonprofit, for $100,000. Students from the American College of the Building Arts in Charleston began researching the residence—which hasn’t been occupied since the early 1990s—and its history early this year. They will present recommendations for the most urgent repairs this spring. In the meantime, the nonprofit braced a vulnerable section of the house and erected a protective, military-grade tent over the structure for $15,000. John Girault, executive director of EIOLT, hopes to open the site to the public and use it to grow heirloom crops and interpret the lives of the island’s African American community after the Civil War.